The legendary endurance stallion Chip Chase Sadaqa passed away peacefully June 15th 2011 at the Toft Endurance farm in Marburg, SE Queensland, Australia, at the age of 34. "Such a kind natured, wonderful performance horse; an unparalleled ambassador for his breed," said Jo Hamilton-Branigan, of Kholonial Performance Arabians. "There aren't enough superlatives to describe him." It was Peter Cole who saw the yearling colt Chip Chase Sadaqa, by Cherokee Mecca out of Silala, by Silver Spot, advertised in 1978 in an Arabian Horse News advertisement. He liked the look in the colt's eye, and bought Sadaqa sight unseen from breeders Pam and John Roydhouse. Sadaqa, a 95,996% Crabbet Arabian out of the Kehailan Rodan strain (Rodania, 1869), would likely have excelled in the showring. However, Sadaqa became a legendary endurance horse, "many times carrying huge weights and winning rides by significant margins," Hamilton-Branigan says, on her Tribute to Sadaqa webpage. He competed for 15 years with his owner Peter Cole, from 1981-1995, with 4,488 lifetime km during these years. He completed 48 of 54 rides (an 88% completion record). He had 14 First Place finishes; 33 top-five placings; 17 Best Condition Awards, 29 First Heavy Weight finishes. He won the 1983 160-km Australian Tom Quilty Gold Cup and was second in 1987 with another endurance legend, Ron Males, riding. He won the 1984 160-km QSC Cheerabah, and he was the Australian National Endurance Champion in 1983. He was awarded the 2008 WAHO Trophy, annually bestowed by the World Arabian Horse Organization, to an Arabian horse in each country who has been an excellent 'ambassador' for the breed. I visited the Tofts and Sadaqa in Australia in 2007, where Sadaqa was still standing at stud at age 30. According to Peter Toft, early on, Pete Cole had bred all kinds of mares to Sadaqa, not select ones; and early on he appeared to be throwing good offspring. Often an endurance stallion becomes great after he’s dead, because after a riding career, he’ll start breeding, and it may not be till his first crop is 10 or 11 before you see if there’s a really great horse or two in there. Then you wait for the next crop or two to see if that was just a fluke. With Sadaqa, it appeared early on that he was no flash in the pan. 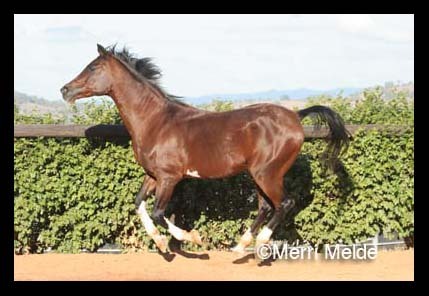 Peter Toft liked Sadaqa offspring, "because they’re intelligent, very tractable and easy to handle, on the ground and in the vet ring, and, they’ve just proved to be good." Into Sadaqa's 30's, seventy percent of his progeny had competed successfully in endurance. His offspring had won major endurance events in Australia, the Australian National and State Championships across Divisions (Junior, Lightweight, Middleweight and Heavyweight), State Pointscore and Distance Awards, and Best Conditioned Awards in all Divisions over all Distances. He will be greatly missed by the endurance world, but his superb performance record in endurance, and his influence as one of the great world-ranked endurance sires will likely remain with us a long time. In this video – Chip Chase Sadaqa – a purebred Australian Arabian stallion (reg AHSA) was honoured by the endurance fraternity as a “living legend”. In this historic video Sadaqa is 32 yrs of age (b.Jan 1977) and he is presented by Ron Males (on behalf of Toft Endurance). The presentation took place at the National Championship 160km (Endurance) Ride – the Tom Quilty Gold Cup 2008. Sadaqa was also the recipient of the inaugural Australian WAHO Trophy for 2008. (Video courtesy of Youtube: Kholonial, Jo Hamilton-Branigan).